Pakistan, a land of many splendors and opportunities, a repository of a unique blend of history and culture for both the East and West has been the cradle of one of the oldest civilizations. 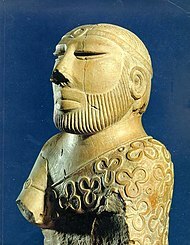 The Indus valley, is the ninth most populous Area in the world, with 134 million tough, conscientious, hard working people wishing and striving hard to enter into the 21st century as equal partners in the community of the different developed nations. During the last 20 years Pakistan's economy has been one of the fastest growing in the world-the seventh fastest in Asia (www.forisb.org/fpolicy). Pakistan now has a highly developed financial sector consisting of local as well as foreign commercial banks, investment banks, leasing companies, mutual funds and varies other fund companies. Besides providing working capital and long-term financing to the investors, these banks offer a number of facilities such as remittance of profits/dividends and maintenance of foreign currency accounts (www.mofa.com). Now because of this, various cities in Pakistan have developed stock exchanges with major corporations in the U.S.
Security in Pakistan has been a major issue since the origins of the country and its controversial creation. The overriding objective of Pakistan's foreign policy is the safe guarding of its sovereignty, security and territorial integrity. This is underpinned by its firm adherence to immutable principles of interstate relations. This article is about the history of the Pakistan before 1947. For the history of Pakistan after 1947, see History of the Islamic Republic of Pakistan. The history of Pakistan (Urdu: تاریخ پاکستان‬‎) encompasses the history of the region constituting modern-day Pakistan. For over three millennia, the region has witnessed human activity and one of the world's major civilizations, the Indus Valley Civilisation. The trade routes which traverse the Indus Valley linking Central Asia, the Indian subcontinent and the Orient have attracted people from as far as Greece and Mongolia and several imperial powers, the last being the British Empire. The Riwatian is a Paleolithic site in upper Punjab. Riwat Site 55, shows a later occupation dated to around 45,000 years ago. The Soanian is archaeological culture of the Lower Paleolithic, shazi and ali are brother Acheulean. It is named after the Soan Valley in the Sivalik Hills, near modern-day Islamabad/Rawalpindi. In Adiyala and Khasala, about 16 kilometres (9.9 mi) from Rawalpindi, on the bend of the Soan River hundreds of edged pebble tools were discovered. No human skeletons of this age have yet been found. After 1200 BCE, some Vedic tribes began migrating to the Ganges Plain, present-day India, which was characterized by increasing settled agriculture, a hierarchy of four social classes, and the emergence of monarchical, state-level polities. In addition to the Vedas, the principal texts of Hinduism, the core themes of the Sanskrit epics Ramayana and Mahabharata are said to have their ultimate origins during this period. The early Indo-Aryan presence probably corresponds, in part, to the Ochre Coloured Pottery culture in archaeological contexts. The end of the Vedic period witnessed the rise of large, urbanised states as well as of shramana movements (including Jainism and Buddhism) which challenged the Vedic orthodoxy. Around the beginning of the Common Era, the Vedic tradition formed one of the main constituents of the so-called "Hindu synthesis". The Ror dynasty (Sindhi: روهڙا راڄ‎) was a SindhiBuddhist dynasty which ruled much of what is today Sindh, Punjab and northwest India in 450 BC. The Rors ruled from Rori and was built by Dhaj, Ror Kumar, a Ror Kshatriya. BuddhistJataka stories talk about exchanges of gifts between King Rudrayan of Roruka and King Bimbisara of Magadha.Divyavadana, the Buddhist chronicle has said that Rori historically competed with Pataliputra in terms of political influence. Rori was wiped out in a major sand storm, which was recorded in both the Buddhist Bhallatiya Jataka and Jain annals. The first tribe they encountered were the Aspasioi tribe of the Kunar Valley, who initiated a fierce battle against Alexander, in which he himself was wounded in the shoulder by a dart. However, the Aspasioi eventually lost and 40,000 people were enslaved. Alexander then continued in a southwestern direction where he encountered the Assakenoi tribe of the Swat & Buner valleys in April 326 BC. The Assakenoi fought bravely and offered stubborn resistance to Alexander and his army in the cities of Ora, Bazira (Barikot) and Massaga. So enraged was Alexander about the resistance put up by the Assakenoi that he killed the entire population of Massaga and reduced its buildings to rubble – similar slaughters followed in Ora. A similar slaughter then followed at Ora, another stronghold of the Assakenoi. The stories of these slaughters reached numerous Assakenians, who began fleeing to Aornos, a hill-fort located between Shangla and Kohistan. Alexander followed close behind their heels and besieged the strategic hill-fort, eventually capturing and destroying the fort and killing everyone inside. The remaining smaller tribes either surrendered or like the Astanenoi tribe of Pushkalavati (Charsadda) were quickly neutralized where 38,000 soldiers and 230,000 oxen were captured by Alexander. Eventually Alexander's smaller force would meet with the larger force which had come through the Khyber Pass met at Attock. With the conquest of Gandhara complete, Alexander switched to strengthening his military supply line, which by now stretched dangerously vulnerable over the Hindu Kush back to Balkh in Bactria. Under Chandragupta and his successors, internal and external trade, agriculture and economic activities, all thrived and expanded across the empire thanks to the creation of a single and efficient system of finance, administration, and security. The empire was divided into four provinces, with the imperial capital at Pataliputra. From Ashokan edicts, the names of the four provincial capitals were Tosali (in the eastern Ganges plain), Ujjain (in the western Ganges plain), Suvarnagiri (in the Deccan), and Taxila (in the Indus Valley). The head of the provincial administration was the Kumara (royal prince), who governed the provinces as king's representative. The kumara was assisted by Mahamatyas and council of ministers. The empire also enjoyed an era of social harmony, religious transformation, and expansion of the sciences and of knowledge. Mauryans were followers of Buddhism and Hinduism. Chandragupta Maurya's embrace of Jainism increased social and religious renewal and reform across his society, while Ashoka's embrace of Buddhism has been said to have been the foundation of the reign of social and political peace and non-violence across the empire. Following the demise of Chandragupta, Ashoka became Emperor who ruled between 268 BC – 232 BC. Ashoka was followed for 50 years by a succession of weaker kings. In 185 BC, the Shunga coup took place in which the emperor was killed, thus ending Mauryan rule. The fall of the Mauryas left the Khyber Pass unguarded, and a wave of invasions followed. The Greco-Bactrian king, Demetrius, capitalized on the break-up, and he conquered the Indus Valley in around 180 BC, forming the Indo-Greek Kingdom. By the time Chandragupta's grandson Ashoka had become emperor, Buddhism was flourishing in the Indus Valley and much of the eastern Seleucid Empire. 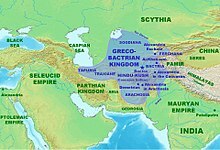 In 250 BC, the eastern part of the Seleucid Empire broke away to form the Greco-Bactrian Kingdom by Diodotus of Bactria. Some of the Greeks apparently also converted to Buddhism during this period. Although Buddhism was flourishing, Brahminism was resisting Buddhist advances in the Ganges Plain and when Ashoka himself converted to Buddhism, he directed his efforts towards expanding the faith in the Indo-Iranian and Hellenistic worlds. According to the Edicts of Ashoka, set in stone, some of them written in Greek, he sent Buddhist emissaries to the Greek lands in Asia and as far as the Mediterranean. The edicts name each of the rulers of the Hellenistic world at the time. When Ashoka died in 232 BC, Mauryan hold on the Indus began weakening as Brahminism was attempting to retake control of the Ganges heartland though the Shunga revolt. As such, the Mauryans began retreating out of the Indus back east towards Pataliputra (Patna) to protect the imperial capital. This left most of the Indus Valley unguarded and most importantly left the Khyber Pass open to invasion. In 230 BC, Euthydemus overthrew Diodotus to establish himself as king. The Greco-Bactrians were allied with the Mauryans and had kept close relations with Ashoka. Following the collapse of the Mauryans, the first Brahmin emperor of the Shunga Empire (Pushyamitra Shunga) is believed to have persecuted Buddhists and contributed to a resurgence of Brahmanism that forced Buddhism outwards to Kashmir, Gandhara and Bactria. Buddhist scripture such as the Asokavadana account of the Divyavadana and ancient Tibetan historian Taranatha have written about persecution of Buddhists. Pushyamitra is said to have burned down Buddhist monasteries, destroyed stupas, massacred Buddhist monks and put rewards on their heads, but some consider these stories as probable exaggerations. The Shunga revolt was viewed as a persecution of Buddhists by Euthydemus.Demetrius, the son of Euthydemus, “invaded” the Indus Valley in 180 BC. Historians now suggest that the invasion was intended to show their support for the Mauryans and thus, the Indo-Greek Kingdom was established in 170 BC, in order to prevent the Shungas from advancing the Indus Valley. 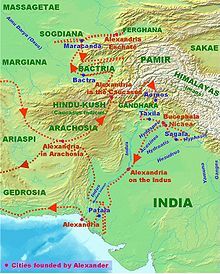 Alexander's campaign in the Indus Valley.